Product #55658 | SKU ASU800NS38-256GT-C | 0.0 (no ratings yet) Thanks for your rating! Comes with intelligent SLC Caching and a DRAM Cache Buffer to boost read/write performance. 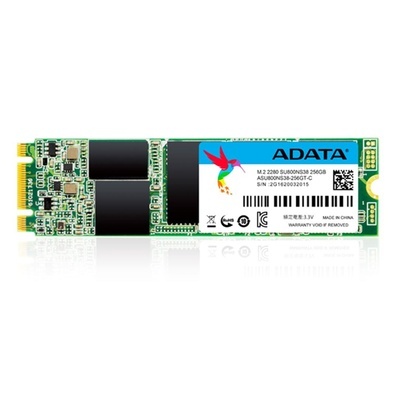 Utilizing 3D NAND Flash and a high-speed SMI controller, the compact ADATA 256GB SU800 SATA M.2 2280 3D NAND SSD provides capacities up to 1TB and greatly enhances performance, efficiency, and reliability over traditional 2D NAND. It also comes with intelligent SLC Caching and a DRAM Cache Buffer to boost read/write performance. Featuring LDPC ECC and technologies such as high TBW (total bytes written) and DEVSLP (Device Sleep), the SU800 M.2 2280 instantly upgrades notebook and desktop PCs with superior stability, durability, and power efficiency. Implementing 3D NAND Flash, a high-quality SMI controller, carefully-selected components, and several advanced performance-enhancing technologies, the SU800 M.2 2280 outperforms traditional HDDs by a huge factor, with particular benefits in boot up and seek time, as well as overall much faster read/write throughput.